This week we travel to the Big Easy, home of the New Orleans Saints. Unlike when we met the Saints last time, they are no longer undefeated. However, we are in their house and our players are only blocks away from Bourbon Street. So in honor of our trip to Nola, I try my hands at some good old southern and Cajun cooking. So this week I introduce my Cajun Blackened Catfish. Mix all of the Cajun remoulade ingredients together in a bowl. Cover the bowl and refrigerate until needed. Preheat a cast iron skillet or a large nonstick skillet to medium high with peanut oil. Next, mix blackening rub ingredients together. 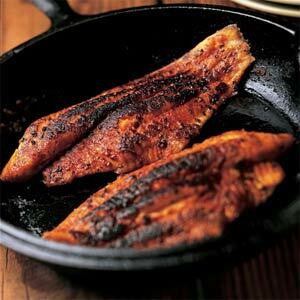 Cover both sides of catfish with the seasoning mix and place in skillet. Cook the first side for 4 minutes and turn and cook for another 4 minutes on the other side. Remove from pan and serve with Cajun remoulade.